You can enter the name of your dealership or of your home port (cruising area). 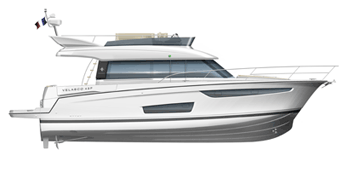 Jeanneau has a vast network of dealerships located in over 80 countries. This network guarantees each customer the professional advice and exemplary service that he or she has the right to expect from a large shipyard. Jeanneau dealers are your preferred contacts, able to answer all your questions concerning the purchase of a boat, as well as assisting with after-sales service requests, spare parts and answering technical questions. The very first Sun Fast World Cup was a magnificent success! The first Sun Fast World Cup has just concluded, and it was a resounding success. This challenge took place in very good conditions in La Trinité-sur-Mer on April 6th and 7th. The Cap Camarat 9.0 CC and the Merry Fisher 1095 are finalists for 2019 Motor Boat Awards!